The Kapoor family accepted the National Film Award for Best Actress on behalf of late actor Sridevi on Thursday in New Delhi. 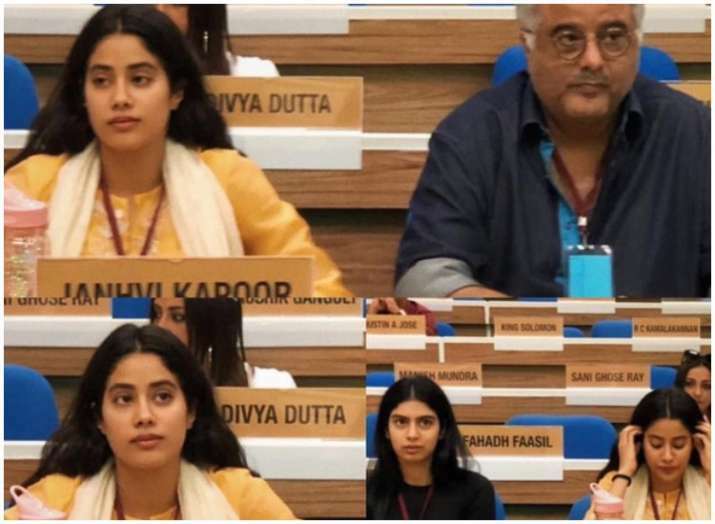 Boney Kapoor and daughter Janhvi Kapoor and Khushi Kapoor are currently in New Delhi where they attended the 65th National Film Awards 2018. The Kapoor family accepted the National Film Award for Best Actress on behalf of late actor Sridevi, which was conferred upon her posthumously for Mom (2017). The Nattional Awards 2018 was held at Thursday afternoon at Vigyan Bhawan. While the excitement was high, several awardees expressed disappointment after they were informed that the President of India, Ram Nath Kovind would attend the prize distribution ceremony for only an hour. President Kovind only handed out 11 awards within the that one hour, which included late actors Sridevi and Vinod Khanna. The pictures and videos of Boney Kapoor, Janhvi and Khushi rehearsing for National Film Awards event went crazy viral and have been shared widely on social media. Recently, Boney Kapoor with daughters Janhvi Kapoor and Khushi Kapoor were spotted at the Indira Gandhi International Airport in New Delhi. After the award was announced, Boney Kapoor in a statement said, "'Today, we, as a family, do not know whether we should celebrate or not. We don't know if we should feel elated, laugh with joy, or cry while remembering her. The National Award has come posthumously, but it's something we cherish while remembering her for the artiste that she was. She was a perfectionist, and that was evident in all the 300-plus films she did. It's time to celebrate her achievements. Her legacy will always live on." There was much buzz across social media as well. The National Film Awards, established in 1954, are presented in two main categories — Feature Films and Non-Feature Films. The juries, both regional and at the Central level, are appointed by the Directorate of Film Festivals in India for selection of the films.